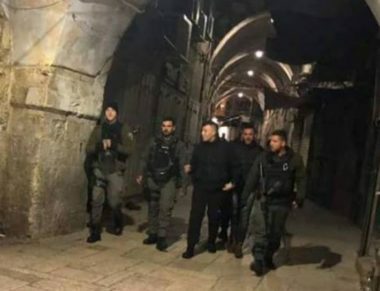 Israeli soldiers abducted, late at night and on Friday at fawn, seven Palestinians, including two children, during massive and violent searches of homes, in the Old City of occupied East Jerusalem. Media sources said the soldiers abducted Abada Najib, Mahmoud Najib, Wahid al-Bakri, and Fadi Oleyyan, from their homes in the Old City, and took them to an interrogation facility. On Thursday evening, the soldiers also invaded homes and abducted two children, identified as Abdul-Rahman Daher Sharabati and Ehab Taha, from the Old City. In addition, the soldiers abducted Sheikh Noureddin Rajabai, while leaving the Al-Aqsa Mosque.